This article answers basic questions the National Electric Code (NEC) for homeowners. This article series provides information about a variety of electrical hazards in buildings, with articles focused on the inspection, detection, and reporting of electrical hazards and on proper electrical repair methods for unsafe electrical conditions. Even when a hot line switch is off, one terminal on the switch is still connected to the power source. Before doing any work on the switch, the power source must be turned off by set­ting a circuit breaker to OFF or removing a fuse. Building code enforcement authorities and local laws in many communities require that electrical work be performed only by a licensed electrician. In some communities local laws permit certain electrical work to be done by the homeowner without a permit and without conflict with local codes. Contact your city or village building department for a copy of local regulations. In any case, any electrical work, new wiring, repairs, replacements of parts, must comply with the requirements of both local laws and the National Electrical Code. Since the electrical code is written by experts and since the "code" is intended to assure that electrical wiring in a building is functional, adequate, and most of all, safe, not only should electrical work comply with the code to be legal, it should comply with the code to be safe. Electrical work by the homeowner might affect not only safety but also fire insurance coverage. If a fire loss claim results from wiring you installed, the company may classify you in a higher risk category or in some cases your insurance company may fail to honor your claim entirely. 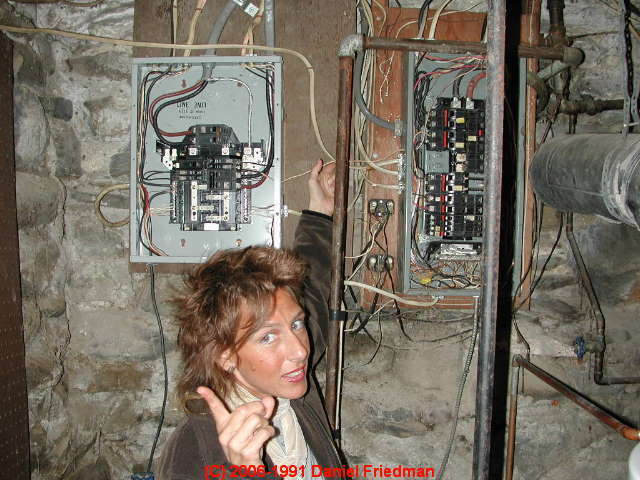 The National Electrical Code Book provides thorough, very detailed instructions for determining the adequacy of an electrical wiring system and is written intending to guide a professional electrician (not a homeowner) in the safe repair and modification of electrical systems such as lighting, receptacles, and electrical wiring. The chances are your house wiring was safe and adequate when your house was built. It is probable, too, that your house wiring was originally done in accordance with the National Electrical code. This code was developed by the National Fire Protection Association and is revised from time to time. TheUS National Electrical Code or "NEC" itself has legal status only insofar as it has been adopted by cities, towns, counties, and other governmental units as part of local building ordinances. The status of the code in your locality can be determined by contacting the building inspection department of your local government. The National Electrical Code does not provide step-by-step instruction. Rather, the code specifies the preferred method of performing electrical wiring tasks and the proper materials to use in various in various applications. Incidentally, the code does not limit or prohibit electrical work by a homeowner, but as we explained above, local laws may require that you hire a licensed electrician. Beware: understanding the electrical code requires some expertise. Even licensed electricians often buy a version of the National Electric Code which includes explanations, interpretations, and sketches to help clarify the details of safe electrical wiring practices. Most home electrical work is surprisingly easy to do; the system is logical; replacement parts are standardized so they will fit anywhere in the U.S. The NEC is published by the National Fire Protection Association (NFPA) and can be easily obtained from that association directly as well as from lots of online book-sellers. The NEC is also available to read online as an electronic document as well as in the form of a large (1000 page) bound book. The text remains © protected property of NFPA however. So to print the text you need to buy the CD ROM of the code from NFPA, or buy the book itself. Copies of the electrical code are probably also available at your local library. Copes are often on sale in electrical supply stores and in some book stores. A some­what simplified version of the electrical code, known as the "One- and Two-Family Residential Occupancy Electrical Code," less costly than purchasing the entire NEC. The simplified edition covers the most popular and widely used wiring methods. The Canadian Standards Association (CSA) has been publishing the Canadian Safety Standard for Electrical Installations since 1927. This document forms the basis for electrical codes adopted in the individual Canadian provinces. The U.S. and Canadian electrical codes differ in some technical details but are slowly merging. The 2006 Canadian Electrical Code draws from the International Electrotechnical Commission (IEC) Standard 60364, the European standard for electrical wiring. In the U.K., electrical wiring is specified by the UK Institution of Engineering and Technology (IET) in IEE Wiring Regulations BS 7671 which, like the CSA code, draw on IEC 60634. In Australia and New Zealand, electrical wiring is specified by the wiring rules in AS/NZS 3000. Electrical codes require that all wire connections or cable splices be inside an approved metal or plastic box. You cannot bury a box inside a wall - that is, you cannot hide or cover over a junction box with a finished surf race like drywall or paneling. The junction boxes in a home must all must be accessible. This protects your home from the danger of fire and makes it easier to inspect and upgrade your wiring in the future. The size, shape, and type of electrical junction box you need to choose depends on what it's for. Boxes vary in size, depth, and material. The junction box you need to use to join wires together in an attic for a splice is not the same shape as a box you need to use to install a single electrical outlet. Even the choice of a single junction box to install a single electrical outlet on an existing electrical circuit will be affected by the number of electrical wires that have to enter the box (more wires need more cubic inches of space to be wired safely). These details are spelled out in the National Electrical code as well as in subsets of the code written and amplified to guide installers of residential electrical wiring. A very common homeowner task that some people tackle is replacing a worn electrical outlet, or more complicated, adding a new electrical outlet in a building. While this task is not difficult, if it is not done properly there can be a real risk of fire or shock or even a fatality. 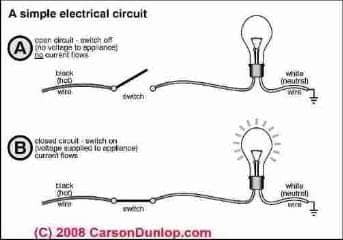 See ELECTRICAL OUTLET, HOW TO ADD & WIRE for an example of a simple task that has more details that need to be correct than you may have thought. Never attach more than one wire to a terminal. Codes prohibit it, and it's unsafe because terminal screws are made to hold only one wire. An easier way to join many wires to a terminal is to cut a short piece of wire (about 4 inches), strip both ends, and splice it to the other wires to form a pigtail. See ELECTRICAL SPLICES, HOW TO MAKE for details of the proper procedure for splicing wires together. 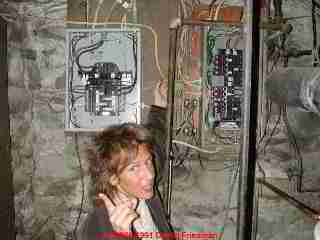 Grounding to trip the circuit breaker or blow the fuse: Electrical grounding is necessary to protect people from electric shock by providing a good electrical path to route a faulty electrical connection (such as a SHORT CIRCUIT) to ground (literally, to the earth) so that current will flow through and thus trip the circuit breaker or blow the fuse, safely and quickly turning off the electrical circuit. Grounding to route stray electricity from static electricity, electrical power surges, lightning, etc. to ground. This can protect the insulation on electrical wires from damage due to high voltage. The protection against static electricity helps reduce the chances of an un-wanted spark that can cause damage to electronic components or cause an explosion of nearby combustible gases. Grounding to provide a normal path for electricity to flow: energy flows in an building's electrical circuit from a power source (the utility pole through electrical panel, though building circuits and electrical devices connected to them) to the ground, to earth. If there is no good connection to earth, electricity does not flow, though it might if you stand on wet ground and touch a live electrical wire - an action that could be fatal. Ground and neutral are related electrical terms. Neutral is used to describe the "return path" from in an electrical circuit to the electrical panel. See ELECTRICAL GROUND SYSTEM INSPECTION for a detailed example of the importance of proper electrical ground connections and of what can go wrong if the electrical ground wiring is faulty. 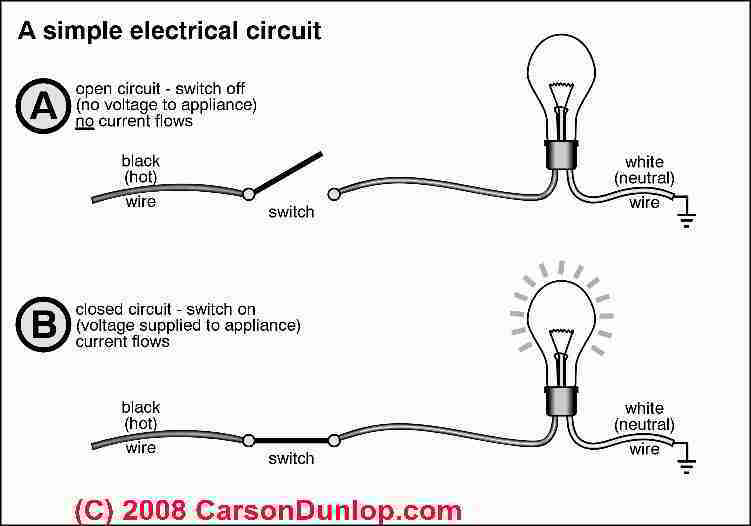 See ELECTRICITY BASICS, HOW IT WORKS for a very basic explanation of electricity. See DEFINITIONS of ELECTRICAL TERMS for more explanation of electrical potential or volts. In that section, see Definitions of Electrical Equipment Ground, Grounded Electrical Conductor, Ground, Ground Rod & Ground Bond for details. What Authorities or Certifications Make Electrical Components Legal for Use ? Listed Electrical Equipment: as defined in the U.S. National Electrical Code (NEC) (CSA provides similar terms) as: equipment, materials, or services included in a list published by an organization that is acceptable to the authority having jurisdiction and concerned with evaluation of products or services, that maintains periodic inspection of production or listed equipment or materials or periodic evaluation of services, and whose listing states that the equipment, material, or services either meets appropriate designated standards or has been tested and found suitable for a specific purpose. In simpler terms this means that listed electrical equipment (circuit breakers, wires, connectors, switches, receptacles, and more) has been tested by someone whose procedures are acceptable to your state, provincial, or city or town electrical inspectors. By implication, an electrical part that has not been listed may not be approved for use in a building, and by implication, may be unsafe. Labeled Electrical Equipment is equipment or materials to which has been attached a label, symbol, or other identifying mark of an organization that is acceptable to the authority having jurisdiction and concerned with product evaluation, that maintains periodic inspection of production of labeled equipment or materials, and by whose labeling the manufacturer indicates a compliance with appropriate standards or performance in a specified manner. In practice we've seen a range of care in the application of standards, testing, listing, and supervision, in the listing and labeling of electrical products, extending from serious, responsible, and proper, to improper and downright dangerous over the history of electrical products. An example of improper labeling practices was documented in the history of the FPE Stab-Lok electrical panels and circuit breakers: the manufacturer lost their UL label for a time after getting caught placing labels on equipment where they did not belong. See FEDERAL PACIFIC FPE HAZARDS for details. An example of a long-established listing organization for electrical products is Underwriters Laboratories, founded in 1894 by William H. Merrill, an electrical engineer who supported the development of electrical standards, testing, and protection from electrical hazards. Originating in the United States, UL has facilities in more than 100 countries. Underwriters' Laboratories Inc. is a nonprofit organization that per­forms tests on electrical products. If an item meets minimum safety standards avoidance of fire and shock, it is listed with the Underwriters' Laboratories. Listed items display the UL seal on the item or on its package. This indicates minimum compliance standards. Products having a wide variety of prices may all have the UL seal. Higher priced items will generally have additional features for convenience or longer life. Continue reading at ELECTRICAL WIRING BOOKS & GUIDES or select a topic from closely-related articles below, or see our complete INDEX to RELATED ARTICLES below. Or see ELECTRICAL CODE BASIC FAQs - questions & answers about electrical codes posted originally on this page. ELECTRICAL CODE BASICS at InspectApedia.com - online encyclopedia of building & environmental inspection, testing, diagnosis, repair, & problem prevention advice.